The MaxSeal Wall Model pet door offers you the ultimate in pet door design. We use only the highest quality components to fabricate one of the industry's best selling, high performance pet doors for walls. Security Boss is setting the standard for pet doors in terms of pet door quality. Our units are proudly assembled in La Crosse WI. USA. 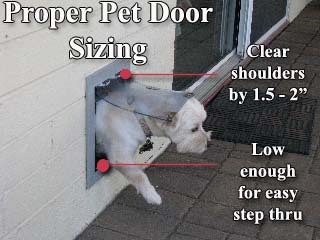 Customers can customize their door with several options that make each pet door unique for their home. 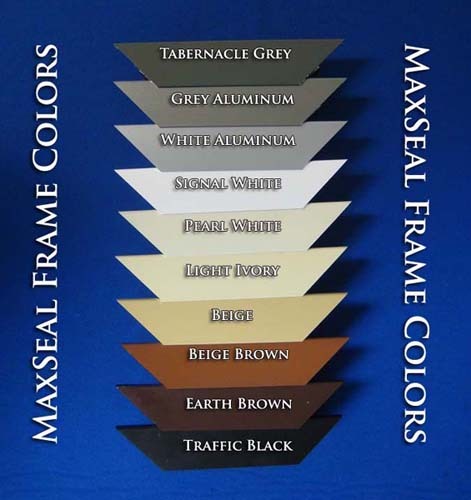 Whether it be the direction the security panel loads, the color options, high wind accessory magnets for very challenging environments or the option to get a door that will accommodate an aging pet with arthritis, Security Boss offers our customers the most flexibility and the best performing product in the shortest amount of time. Step 3: Find a suitable area for your wall model. 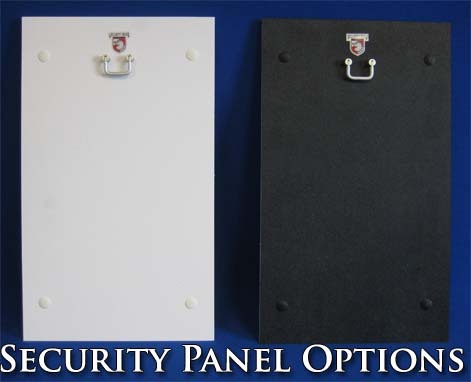 Wall models have an Insulated security panel that lift out vertically (side loaded panel models are available as needed). Make sure there is enough room to remove this Panel. To install in a framed wall, place the door between studs. Mark the stud locations and position the door between the studs. Check both sides of the wall to make sure the area you cut is free of wiring and plumbing. Step 4: Position the MaxSeal tunnel against the interior wall. Trace the perimeter of the tunnel upon the wall. Check the dimension of the wall marking against the measurements of the tunnel. Make sure your opening is square and level. (We recommend that you use the rough-cut information below as sometimes the outer perimeter of the tunnel can vary. You may also make a template with the rough-cut information for your size pet door, then trace from the template on the wall). Step 5: Cut a small hole near the center of the traced outline in step 4. Look for obstructions within the wall. The smaller the opening the easier the repair should obstructions be found. Use your hand to feel for any obstructions that may not have been seen. Step 6: If there are no obstructions then cut the inside wall on the lines traced in step 4. Use a drywall saw or utility knife. Once the interior lines have been completely cut, remove the drywall and insulation from the opening. Step 7: At each corner of the cutout, use a long drill bit to drill through the exterior fascia. Use a Masonry bit for stucco or stone exterior construction. Step 8: On the exterior wall, find the corner holes you drilled in Step 7 and draw your tunnel outline on the wall. Make sure your opening is square and level. Step 9: Drill two additional holes at each corner that are on the tunnel outline. Elongate these holes so you can insert a reciprocating saw blade. Step 10: Use a reciprocating saw to complete the exterior cutout of the opening. Step 11: Place the inside frame with attached tunnel through the wall cutout. From the outside, hold the inside frame tight against the wall by reaching through the door opening. Mark the tunnel with a marker along the outside wall. Step 12: Remove the interior door frame and tunnel from the hole. Cut the tunnel along the marked lines in step 11 with tin snips to make the tunnel fit your wall thickness. Step 14: Caulk between the outside frame and the outside wall at the top and both sides. DO NOT CAULK AT THE BOTTOM OF THE OUTSIDE FRAME. This will restrict the drainage of moisture from inside the door. Step 15: Measure the width of the tunnel between the door frames and cut the included carpet to the correct width and length to cover the distance between the door frames. To keep the carpet in place use silicone adhesive. Press the carpet into the bottom of the tunnel first, then attach it to the sides of the tunnel. Replacement rivets have been included with your hardware kit should the ones on the MaxSeal Insulated Security panel work loose. Install by pressing the two pieces together from opposite sides of the panel in the pre-drilled holes. The Thumbscrews that attach the flaps are factory tightened. Through use, the thumbscrews occasionally loosen and therefore should be checked regularly for tightness. Re-tighten the thumbscrews using the included Allen wrench. The magnets on all MaxSeal doors are adjustable. This allows a precise seal no matter the weather or size of the flap throughout the years. The magnets are positioned in the frame with a pressure fit. The Magnet is held by an aluminum carrier that can slide in and out of the painted frame rail. The best way to lift the magnet is by using pliers to lift the magnet out of the frame rail. BE SURE TO COVER THE MAGNET AND CARRIER WITH A TOWEL TO PREVENT SCRATCHING OF THE FRAME AND CARRIER. Only lift the magnet the minimum required to make the magnet touch the strike plate on the flap. If the Magnet Carrier becomes loose within the frame after adjustment, simply pry the two legs of the magnet apart and reinsert into the frame rail. The magnets are adjusted correctly when there is no airspace between the magnet and the strike plate. Once the magnets are positioned properly, your replacement flaps is installed.